Your horse’s hooves go through a lot. Whether spending their days wandering around pastures, walking along the roads, or standing in the stable, your horse’s hooves go through a lot. In this article, we will be looking at the ways in which you can protect your horse’s hooves on a daily basis and keep them healthy, clean, and properly maintained for years to come. To keep your horse’s hooves healthy and clear from debris, one of the single most important things you can do is pick out your horse’s hooves on a regular basis. This will give your horse a head start on healthy hooves and a happy and healthy life. Start by removing any small stones lodged in your horse’s feet before mounting your horse and taking him for a ride. When you bring him in for stabling at the end of the day, check for objects in his feet and remove any debris that may have become stuck during the day. Establishing what’s normal for your horse can take a lot of time, but the best thing you can do is spend time with your horse and get to know his normal condition. When handling your horse’s hoof, if done on a regular basis you will be able to notice any changes – such as changes in temperature for example. Locate the digital pulse to check it’s strength under normal conditions, check the firmness, texture, and health of the frog, and be on the lookout for any abnormal growths or other obvious surface problems. Establishing a regular routine of checking your horse’s hooves is a great way to ensure there are no serious problems. The beginnings of thrush in your horse’s hooves are noticeable if you know your horse and his health well. The bacterial condition of thrush is caused by your horse standing in mud, manure, or other wet and filthy conditions for extended periods of time. After a while, the frog becomes damaged and cheesy in texture. Thrush is a serious disposition in horses that can eventually cause lameness and significant damage to your horse’s health, so it is important to treat it as soon as possible and prevent future infections. If your horse suffers from thrush, there are simple over-the-counter remedies you can use to fix the problem. And to prevent any future infections, prioritise keeping your horse’s bedding dry, using rubber matting, or changing to more absorbent shavings that keep your horse drier for longer. This will keep your horse healthier for longer and should help prevent thrush from growing. Puncture wounds are a common problem for horses as they can have nails and other sharp objects pierce their soles and then fall out, leaving behind an entry wound that is prone to infection. However, some punctures remain in your horse’s foot. If this happens, do not pull out the nail or the object. Instead, call your veterinarian right away and have a professional deal with the problem to avoid worsening the issue. If you pick out your horse’s hooves regularly, you will discover punctures within a few hours of their occurrence, allowing your veterinarian to remove the object and advise a course of treatment as soon as possible. Cracks are a common problem in horse hooves and while some are superficial, others can worsen over time and cause sensitive hoof structures. 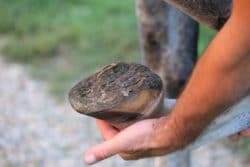 If you begin to notice cracking in your horse’s hoof, call your veterinarian immediately, describe the location and size of the problem and discuss whether or not it needs attention right now or whether it can wait until the next shoeing. Regular visits from your veterinarian are extremely important to ensure the protection of your horse’s hooves. Although six to eight weeks is the average interval for vet visits, there is no standard interval when it comes to correct horse hoof care. If your horse is beginning to show signs of striking back or you’re noticing a flare in the hoof wall, it would be worth scheduling more regular veterinarian visits to help cure and prevent future hoof problems. Fine-tune your horse’s diet (find out what horses eat). Ask your veterinarian whether your horse’s feeding schedule is right for his needs. Add a biotin supplement to his diet to encourage healthy hoof growth. Reduce moisture in the stable by using alternate bedding such as rubber matting. Horse care is a detailed and time-consuming task, but it’s totally worth it for a healthy and protected horse. If you would like to find out more about horse care, visit the Prime Stables blog. We have pages of articles on horse care and how you can best look after your horse. Find out more today and keep your horse healthy all year round.